The "wee folk" are relation to the other fey races of Brownies, Pixies, and Sprites. A Leprechaun stands about 2 foot tall and appears as a miniature human. One's hair color can be blonde, brown or red with a predominant tendency toward reddish versions of all the colors. A male Leprechaun usually prefers to have a beard. Leprechaun clothing tends toward tans and greens with gold buttons and buckles. A leprechaun can speak various Fey languages and invariably speaks Common with a heavy accent called a brogue. Leprechauns have Darkvision out to 60 feet. Because the wee folk are very suspicious of other races, a leprechaun is also very observant and will only be surprised by a roll of 1 on 1d6. A leprechaun prefers to live alone or in small family groups, called clans. Leprechauns can be found mostly in forests, usually in unexplored or rarely used glades. A leprechaun will have a lair that is usually a cave that only a tiny character can get into. Leprechaun will not willingly lead anyone to this lair. Leprechauns have a deep desire for gold and will have treasure that reflects this. Leprechaun are very fearful of humans and dwarfs, because leprechauns believe that these races desire gold that belongs to the wee folk. If there is an elf in the party the leprechaun will ignore any human or dwarf leader and will address the elf, since elves are kindred fey spirits. Leprechaun are tool users and will have tiny swords that are treated like daggers. The wee folk will rarely use small bows. A leprechaun can not use pole weapons. Like Brownies, a Leprechaun will get a +4 bonus to saves versus all magic. Leprechaun have some Thief-like abilities including Pick Pockets, Moving Silently and Hiding also spell-like abilities that can be used at will including Teleport, Confusion and Bane. A leprechaun will use the Hiding and Moving Silently skills to try and avoid a party. If a party does happen to catch a one, the leprechaun will use Pick Pocket skills to steal any gold on the person that is holding him. The leprechaun will then cast a Confusion spell on the party followed by a Teleport. Since the wee folk stay within a range of about 50 miles of the lair they will generally be on target with the Teleport. If prevented from Teleporting the leprechaun will try to buy freedom with treasure or three wishes. Note that the treasure may have a Bane curse (see the Bless Spell in the BFRPG Rules). The wishes will be very limited in what they can do and the Leprechaun will fulfill them, but, put a twist that could severely hurt the wisher; i.e. the leprechaun will tell the wisher where a large treasure is, but, fail to mention the two level 7 red dragons that are guarding it. There is rumor of a Leprechaun King, an exceptionally wealthy leprechaun, with a very twisted idea of how to make a wish turn back on the person making the wish; i.e. “I wish for a mighty sword.” Gives you a +3 sword made from the tooth of a demon, forgets to tell the side effect, for every enemy you kill with the sword there is a chance that the wisher will become a vampire. Last edited by AlMan on Mon May 02, 2016 9:33 pm, edited 2 times in total. 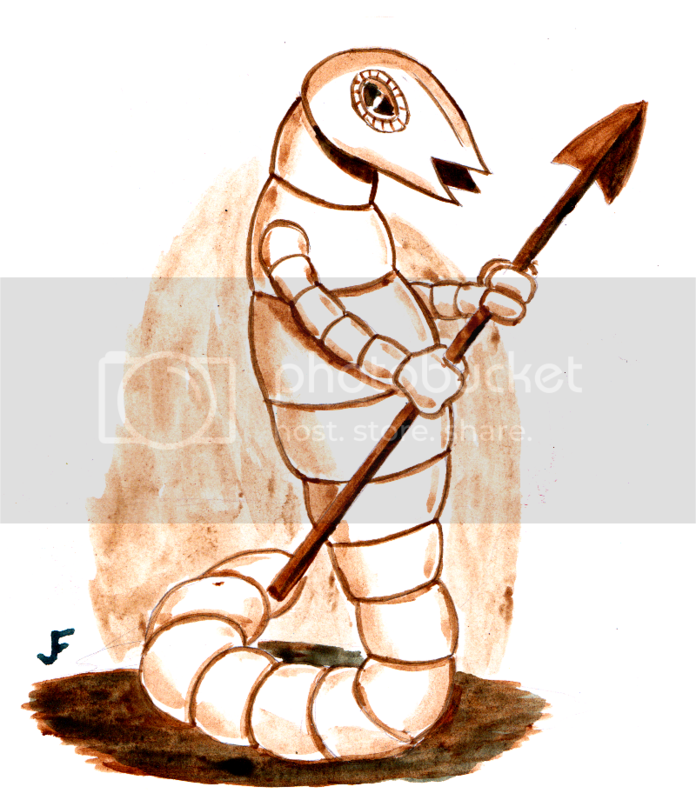 Worm-men are humanoid worms who live deep underground. Each is about 7 feet long, and has two arms near the top of its body. 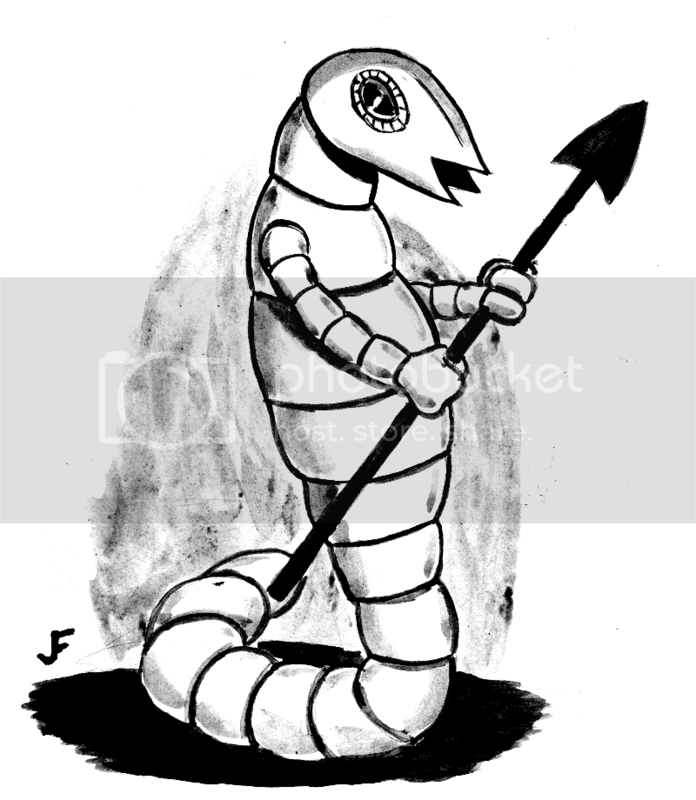 The worm-man may either slither or stand up on its tail to move in a more humanoid fashion. It has large eyes that are mounted on either side of its head, giving the worm-man excellent peripheral vision so that it can only be surprised on a roll of 1 on a 1d6. 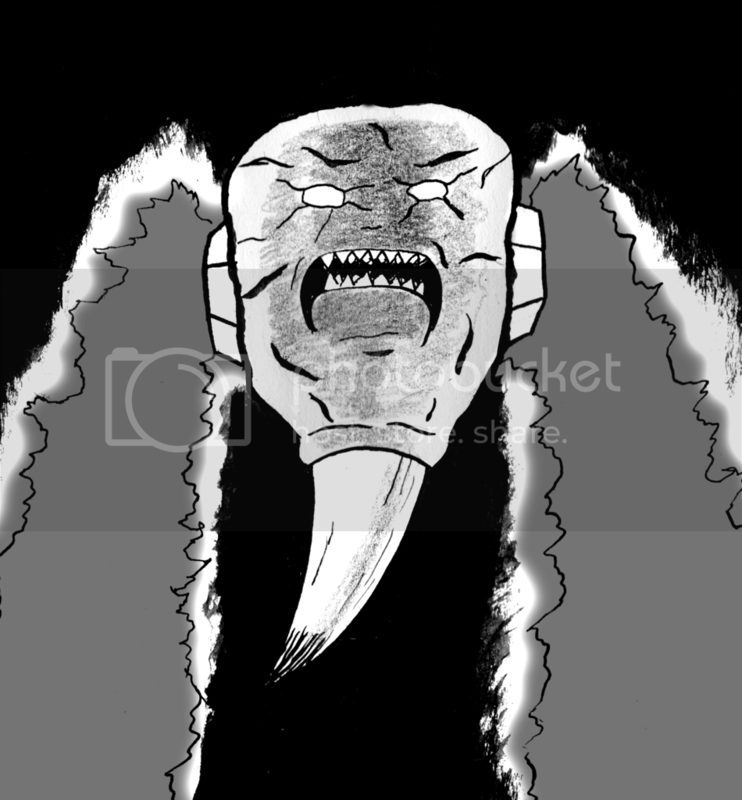 A worm-man can exist on minerals for a time, though bands of worm-men often make forays to the surface to acquire decaying organic matter to supplement their diet. A worm-man is immune to the Sleep spell. Each worm-man has a spell-like ability that functions like a Charm Person spell. However, it has the limitation that the effect will fade once the worm man loses eye contact with the victim. The worm-man may use this ability once per day, and often lead with it during combat. Worm-men live in large communities apart from the other underground civilizations. However, they are often willing to be hired as soldiers by other races. Recently, they have begun to take a move aggressive stance toward the surface, perhaps deciding the time is right for them to consider a campaign of conquest. Last edited by SmootRK on Mon Feb 22, 2016 7:17 am, edited 1 time in total. Reason: minor tweaks to utilize more singular language. These alien creatures stand about 4 feet tall, and have rubbery reddish skin. Their thick skin helps them absorb blows, which gives them a natural armor class of 13. They prefer to use beam weapons that do 1d8 points of damage. If captured, this weapon may be used by player characters, but with a -2 penalty to a ranged attack roll. The captured weapons will have ten charges. They have the ability to stretch one of their arms at a time to a length of 10 feet. This counts as their movement action for that round. This grants them a +2 bonus on a melee attack the first time they use this ability. They may also use this ability in a non-combat situation. They come from another world, and work well for adventures with a science fiction element to them. If used as regular NPC's, perhaps they are travelers who crashed far from home. Rock bats are silicate creatures that resemble asteroids with a horn on the bottom of their bodies. They float by emitting a glowing gravity ray from gemlike growths on the sides of their bodies. Their rocky hide and floating ability gives them a respectable armor class. They attack by dropping directly down on their prey. On a natural 20, the victim is impaled by the rock bat, doing 1d6 continuing damage until the rock bat is slain. 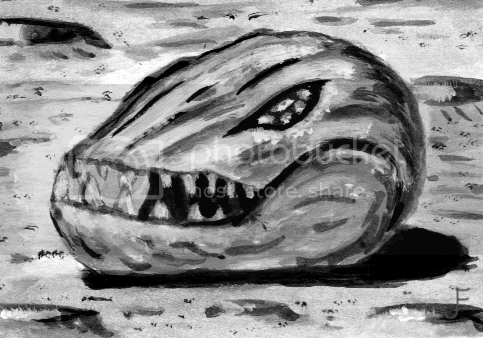 Rock rollers are creatures that resemble living boulders. They are mostly jaw, with jewel-like eyes. They are about the size of a full-grown human. They hunt by hiding themselves high on a cliff or other wall, and then rolling down at their intended prey. After a successful hit, the victim must make a DEXTERITY check. On a failed check, they are knocked to the ground winded. They take no damage, but must spend the next round standing up and catching their breath. They make not move or attack. 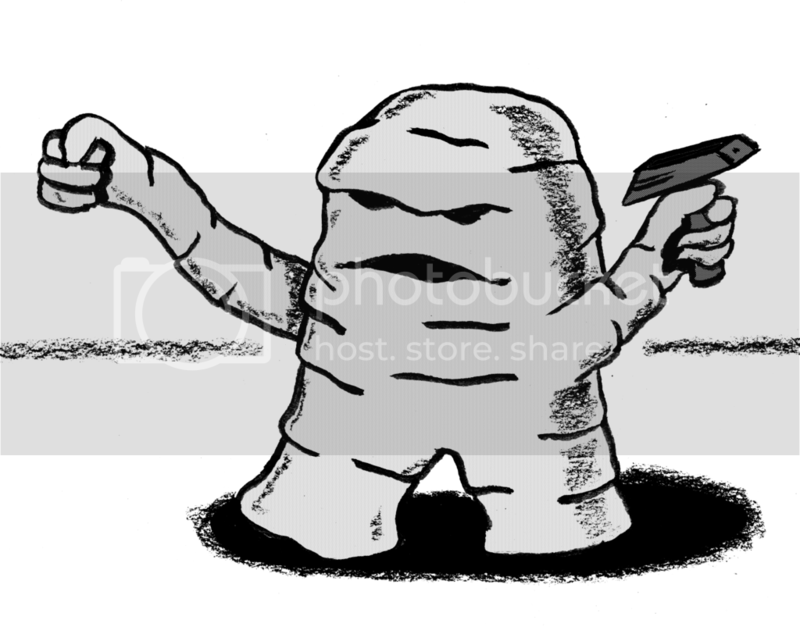 Rock rollers are immune to the spell Charm. A monster of the savannahs and low hills of the south and east, the Dragophant is some foul mixture of dragon and elephant. Some legends speak of a vile experiment, others saying that some tribe angered the ancestors or gods. Where they came from matters little. Though rare, these beasts often travel in small groups dominated by an alpha male. Aggressive and fairly mean-spirited, one appears not to be as intelligent as a dragon, incapable of speech or spell, but at least as clever as the typical dragon. A group of dragophants will move to surround whatever the alpha is attacking and will not need to check morale unless the alpha is killed or incapacitated. Like their dragon brethren, a dragophant will often have treasures, adorning itself haphazardly with shiny baubles and such. Excess treasure that can't be worn or carried is often stashed in a central location in an alpha dragophants territory. Last edited by SmootRK on Mon Feb 22, 2016 7:23 am, edited 2 times in total. Here's a new monster I made some time ago. Lobizons are persons cursed to become human sized malnourished wolf-like creature without tale and with humanoid ears, hands and feet and covered in very short fur. Lobizons live by feeding on the offerings done to the dead (from flowers to candles and even non edible things) they also feed of the remains of the dead and thus are commonly sighted on graveyards where can be as many as 3d4+1d8 Lobizons. They are nocturnal and have darkvision with 30' range. In combat they seek to grab their opponent with both hands, once this is done they will automatically lick him; those licked by the Lobizon must save vs Spell or be afflicted by the curse of the Lobizon on the next full moon. Last edited by Dimirag on Wed Feb 17, 2016 11:10 am, edited 1 time in total. Giant wasps attack when hungry or threatened, stinging their prey to death. They take dead or incapacitated opponents back to their lairs as food for their unhatched young. A victim stung by a giant wasp must make a saving throw vs. poison or die. Last edited by mwest on Thu Feb 11, 2016 1:02 pm, edited 4 times in total. A xorn is a native to the elemental plane of earth. Xorns are about 5 feet tall and wide, weighing about 600 pounds. They speak Common and their own elemental language. Because a xorn’s symmetrically placed eyes allow it to look in any direction, a xorn can’t be flanked. Xorns do not attack fleshly beings except to defend themselves or their property, since they cannot digest meat. Xorns are indifferent to creatures of the Material Plane - with the sole exception of anyone carrying a significant amount of precious metals or minerals, which xorns eat. They can smell food up to 20 feet away. A xorn can be quite aggressive when seeking food, especially on the Material Plane, where such sustenance is harder to find than it is on its native plane. A xorn’s favorite mode of attack is to wait just beneath a stone surface until a foe comes within reach, then emerge suddenly. Groups of xorns often send one of their number to the surface to negotiate for food while the remainder position themselves for a surprise attack. A xorn can glide through stone, dirt, or almost any other sort of earth except metal as easily as a fish swims through water. Its burrowing leaves behind no tunnel or hole, nor does it create any ripple or other signs of its presence. A move earth spell (a spellcrafter's spell) cast on an area containing a burrowing xorn flings the xorn back 30 feet, stunning the creature for 1 round unless it succeeds on a saving throw vs. spells. Last edited by mwest on Thu Feb 11, 2016 1:02 pm, edited 1 time in total. A Zoog is a small rodent-like being with sharp teeth and small tentacles on it mouth. They despise cats and will work diligently to eliminate any feline beings in the area. Zoogs congregate in family units and are quite intelligent. They use tools and one can often find zoogs that have magical ability (1d6 levels of Magic-User with respective HD increases). A zoog climbs trees much like a squirrel may. "In the tunnels of that twisted wood, whose low prodigious oaks twine groping boughs and shine dim with the phosphorescence of strange fungi, dwell the furtive and secretive zoogs;"